Celebrate the coming of spring with this colorful flower cake. This cake was actually inspired by a wallpaper border. When I saw the pattern, I thought it would be fun to use the positive and negative cut-outs in a cake. For this project, I used one layer 12" round cake, filled and frosted smoothly with my favorite buttercream. The finished cake is about 2" high. 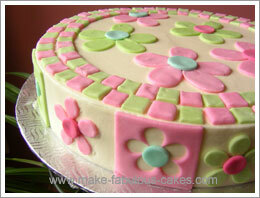 Color the fondant in 4 shades: pink, light green, a bit of light blue and a bit of dark pink. 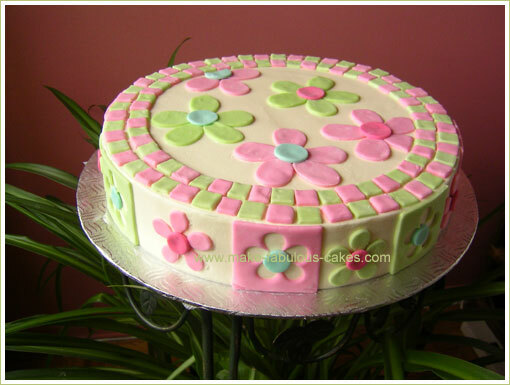 For the decorations on the sides of the cake, roll out the pink and green fondant thin. With a 2" square cutter (this one is from Wilton) cut out a few squares of pink and green. Using a small tear drop shape cutter, punch out 5 petal to form a flower from the squares. Keep the punched-out petals. 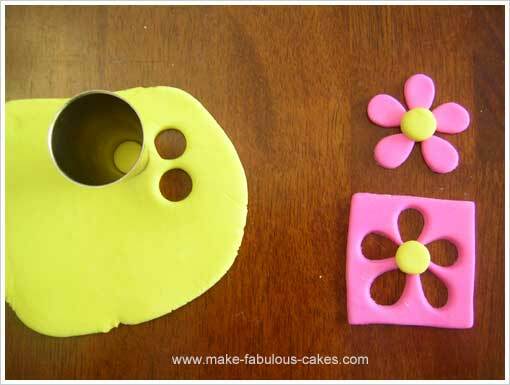 Use a large round tip to cut out form the blue and dark pink fondant a circle to add in the middle of the flower. Apply the punched out squares on the side of the cake. Alternate with the cut-out petals. Brush a bit of water on the circles and attache to the middle of the flowers. 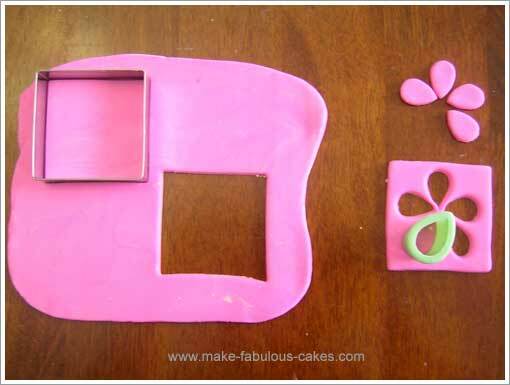 Use a 1/2" square cutter to cut out the mosaic tiles from pink and green fondant to place on the edge of the cake. Using a larger tear-shaped cutter, cut out larger petal shapes to put on top of the cake. Cut a larger circle to add to the center of the flowers.